نانوامولسیون‌ها به‌خاطر خصوصیات منحصربه‌فرد کاربردی خود، در غنی‌سازی بسیاری از ترکیبات آب‌گریز در نوشیدنی‌های بر پایۀ آبی مفید هستند. در این پژوهش نانوامولسیون‌های حاوی ویتامین A و D با به‌کارگیری سورفاکتانت‌های غیریونی مختلف؛ (تویین 60،80 و تویین 85) و روغن‌های ذرت و میگلیول 812؛ نسبت‌های مختلف ویتامین A و D (2:1، 1:1 و 1:2)، نسبت‌های مختلف سورفاکتانت فاز آبی در سیستم (SER) به‌روش تشکیل خودبه‌خودی تولید و آزمون‌های تعیین اندازه و توزیع اندازۀ قطره‌ها، پتانسیل زتا، مورفولوژی، خصوصیات رئولوژیکی، کدورت و پایداری آنها طی 90 روز نگهداری انجام گرفت. تجزیۀ واریانس داده‌های پراکنش نور لیزر کمترین اندازۀ ذرات را مربوط به فرمولاسیون با SER 17/5 درصد و با استفاده از تویین 80 در میگلیول 812 (حاوی 5 درصد ویتامین A و D) نشان داد که برابر 81 نانومتر و پتانسیل زتای 27/9- بود. این فرمولاسیون بهینه در طی مدت زمان نگهداری (3 ماه) در دمای 23 درجۀ سانتی‌گراد پایدار ماند. تصاویر میکروسکوپ الکترونی نیز تأییدی بر نتایج به‌دست‌آمده از اندازه‌گیری اندازۀ قطره‌ها توسط دستگاه اندازه‌گیری ذرات در مقیاس نانو بود. بررسی رفتار رئولوژیکی نانوامولسیون بهینه نیز حاکی از رفتار نیوتنی و وابسته‌‌نبودن ویسکوزیتۀ نانوامولسیون به سرعت برشی بود. پزشکی، الف.، قنبرزاده، ب.، همیشه‌کار، ح.، مقدم، م. و فتح‌الهی، ع. 1394. تهیۀ نانوامولسیون‌های حامل ویتامین A پالمیتات به روش خودبه‌خودی: بررسی تأثیر سورفکتانت و فاز روغنی بر اندازۀ قطرات و پایداری. پژوهش و نوآوری در علوم و صنایع غذایی، 4(4): 299-314. حسنی، ف. 1394. تولید و بهینه‌سازی فرمولاسیون نانوامولسیون حاوی بتاکاروتن (به روش تشکیل خودبه‌خودی). پایان‌نامۀ کارشناسی ارشد، دانشگاه آزاد ممقان. 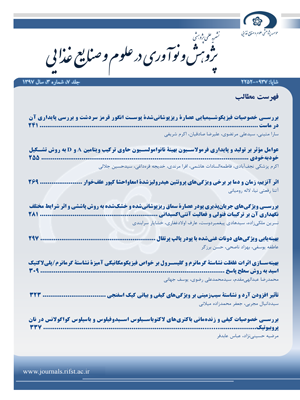 فامیان، ح. 1395. غنی‌سازی شیر‌ کم‌چرب پاستوریزه با استفاده از نانوامولسیون حاوی لینولئیک اسید کونژوگه (CLA). پایان‌نامۀ کارشناسی ارشد، دانشگاه آزاد ممقان. قنبرزاده، ب.، الماسی، ه. و نیک‌نیا، ن. 1392. شیمی و فیزیک سیستم‌های کلوئیدی و محلول‌های بیوپلیمری غذایی. مؤسسه انتشارات علمی دانشگاه صنعتی شریف. مساح، م.، قنبرزاده، ب.، همیشه‌کار، ح. و صوتی‌خیابانی، م. 1392. بررسی اثر ترکیب فاز روغن در تولید نانوامولسیون‌های حاوی آلفاتوکوفرول با استفاده از روش کم‌انرژی. بیست و یکمین کنگره ملی علوم و صنایع غذایی، 9-7 آبان ماه، شیراز. نیک‌نیا، ن.، قنبرزاده ، ب.، همیشه‌کار، ح. و صوتی‌خیابانی، م. 1392. تهیه و ارزیابی نانوامولسیون خوراکی ویتامین E با روش خودبه‌خودی. مجله علوم تغذیه و صنایع غذایی ایران، 4(8): 65-51. Anton, N., & Vandamm, T. 2009. Low energy nano- emulsificasions: overview and potentials in microencapsulation, P. 1-4. XVII International Conference on Bioencapsulation, 24-26 September. 2009. Groningen, Netherland. Champagne, C.P., & Fustier, P. 2007. Microencapsulation for the improved delivery of bioactive compounds into foods. Current Opinion in Biotechnology, 18(2):184-190. Davidov-Pardo, G., & McClements, D.J. 2014. Resveratrol encapsulation: designing delivery systems to overcome solubility, stability and bioavailability issues. Trends in Food Science & Technology, 38(2):88-103. Fathi, M., Mozafari M.R., & Mohebbi, M. 2012. Nanoencapsulation of food ingredients using lipid based delivery systems. Trends in Food Science & Technology, 23(1):13-27. Fatouros, D.G., & Antimisiaris, S.G. 2002. Effect of amphiphilic drugs on the stability and zeta-potential of their liposome formulations: a study with prednisolone, diazepam, and griseofulvin. Journal of Colloid and Interface Science, 251(2):271-277. Ghanbarzadeh, B., Babazadeh, A., & Hamishekar, H. 2016. Nano-phytosome as a potential food-grade delivery system. Food Bioscience, 15:126-135. Gonnet, M., Lethuaut, L., & Boury, F. 2010. New trends in encapsulation of liposoluble vitamins. Journal of Controlled Release, 146(3):276-290. Guttoff, M., Saberi, A.H., & McClements, D.J. 2015. Formation of vitamin D nanoemulsion-based delivery systems by spontaneous emulsification: factors affecting particle size and stability. Food Chemistry, 171:117-122. Klang, V., Matsko, N.B., Valenta, C., & Hofer, F. 2012. Electron microscopy of nanoemulsions: an essential tool for characterisation and stability assessment. Micron, 43(2-3):85-103. Komaiko, J., & McClements, D.J. 2014. Optimization of isothermal low-energy nanoemulsion formation: Hydrocarbon oil, non-ionic surfactant, and water systems. Journal of Colloidal and Interface Science, 425:59-66. Li, Y., Zheng, J., Xiao, H., & McClements, D.J. 2012. Nanoemulsion-based delivery systems for poorly water-soluble bioactive compounds: Influence of formulation parameters on polymethoxyflavone crystallization. Food Hydrocolloids, 27(2):517-528. McClements, D.J. 2005. Food Emulsions: Principles, Practice and Technology. CRC Press: Boca Raton, Florida. Najafi-Taher, R., & Amani, A. 2017. Nanoemulsions: colloidal topical delivery systems for antiacne agents- a mini-review. Nanomedicine Research Journal, 2(1):49-56. Ostertag, T., Weiss, J., & McClements, D.J. 2012. Low-energy formation of edible nanoemulsions: factors influencing droplet size produced by emulsion phase inversion. Journal of Colloid and Interface Science, 388(1):95-102. Rao, R., & McClements, D.J. 2012. Food-grade microemulsions and nanoemulsions: role of oil phase composition on formation and stability. Food Hydrocolloids, 29(2):326-334. Saberi, A.H., Fang, Y., & McClements, D.J. 2013. Fabrication of vitamin E-enriched nanoemulsions: factors affecting particle size using spontaneous emulsification. Journal of Colloid and Interface Science, 391:95-102. Salager, J.L., Forgiarini, A., Marquez, L., Pena, A., Pizzino, A., Rodriguez, M.P., & Rondon-Gonzalez, M. 2004. Using emulsion inversion in industrial processes. Advances in Colloid Interface Science, 108-109:259-272. Silva, H.D., Cerqueira, M.A., & Vicente, A.A. 2012. Nanoemulsions for food applications: development and characterization. Food and Bioprocess Technology, 5(3):854-867. Sood, S., & Gowthamarajan, KJ.K. 2014. Optimization of curcumin nanoemulsion for intranasal delivery using design of experiment and its toxicity assessment. Colloids and Surfaces B: Biointerfaces, 113:330-337. Wulff-Perez, M., Torcello-Gomez, A., Galvez-Ruiz, M.J., & Rodrıguez-Martin, A. 2009. Stability of emulsions for parenteral feeding: Preparation and characterization of o/w nanoemulsions with natural oils and Pluronic f68 as surfactant. Food Hydrocolloids, 23(4):1096-1102. Yang, Y., Leser, M.E., Sher, A.A., & McClements, D.J. 2013. Formation and stability of emulsions using a natural small molecule surfactant: quillaja saponin (q-naturale). Food Hydrocolloids, 30(2):589-596. Yang, Y., Marshall-Breton, C., Leser, M.E., Sher, A.A., & McClements, D.J. 2012. Fabrication of ultrafine edible emulsions: comparison of high-energy and low-energy homogenization methods. Food Hydrocolloids, 29(2):398-406.